This card, which measures about 6¾ inches wide and was produced by Regal Mfg. 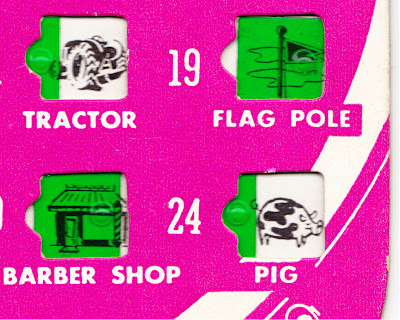 Co. of Chicago, includes such items as wheel barrow, haystack, wood pile, barber shop and pig. Overall, it has an interesting mix of items that would require driving through both rural areas and towns in order to achieve a winning board. On the creative end of the spectrum, the National Wildlife Federation shows how you can make your own Car Bingo boards. Or, on the lazy end of the spectrum, you could just download an app to your kid's iPhone. 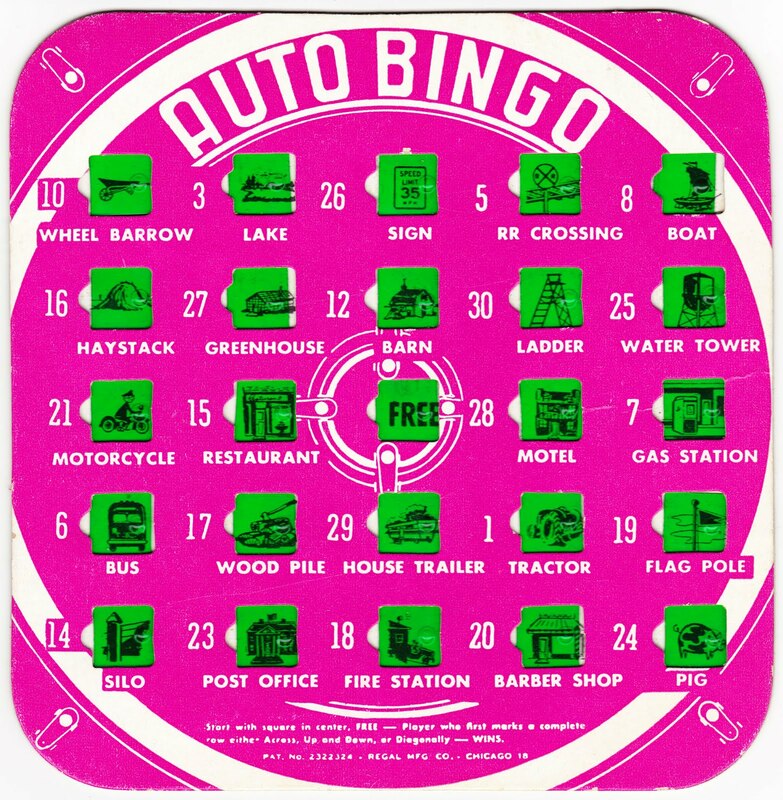 Share your memories of Car Bingo and passing the time on long road trips in the comments section! 1. My sister Adriane and I also played a back-seat game called Lava. The space between us was "lava," and we would hold our hands over it and try to slap each other's hand down into it. 2. The Wikipedia page for Roadkill Bingo is very straight-faced and serious about the game, and includes the following passage: "Controversy may arise when a dead animal is spotted which may not technically be classified as roadkill, and when two players simultaneously spot the roadkill. Players in the front seat have a clear advantage, however, the driver must have someone else mark his or her card. To promote brevity of games, regional variations include animals more likely to be found dead in the particular locale."
. I've bookmarked this site and will return again soon.